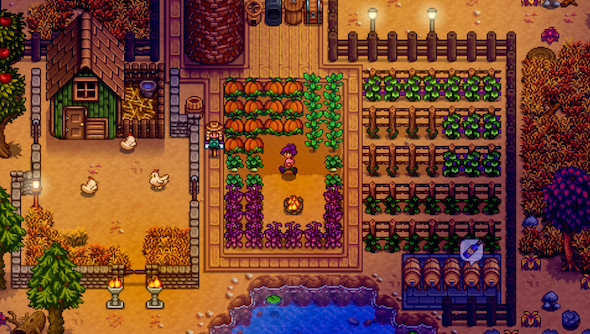 On the second anniversary of Stardew Valley, the indie farm sim’s creator decided it was a good time to let us all in on a little secret – he’s working on a new secret game. Grab a partner for the Flower Dance, Stardew Valley gets its multiplayer beta this spring. Stardew Valley’s creator, Eric “ConcernedApe” Barone, revealed on Twitter that he has a secret game in the works. We already know Barone’s next game will be in the same world but a different genre. “I don’t want to reveal too much at this point, but I am thinking of approaching my next game with a similar mindset to Stardew Valley – take a style of game that was never fully realized (or that changed trajectories, leaving unexplored possibilities), and carry on the tradition in my own weird way,” Barone continued. We already know Stardew Valley’s publisher Chucklefish is working on a new Harry-Potter inspired title, called Spellbound, but this is the first we’ve heard Barone confirm he’s got another game in the pipeline.